Looks Good from the Back: Marianne: Because Saving the Planet is Just As Fun Shopping for Clothes? Marianne: Because Saving the Planet is Just As Fun Shopping for Clothes? Hey guys! This is maybe not the sexiest post (although hell, y'all got pretty excited about Adrien's laundry detergent), but I wanted to write a bit about something we've done in the past year that has made me feel really good--cutting down the amount of single-use plastics we consume. See? SEXAY. But seriously, we recycle and use reusable grocery bags, but I've been feeling for a while that we could do more. Interested in what I've bought and how it works for us? Giddyup. As the owners of pets and small children (yes, I own them until they are 18), we used to go through a lot of paper towels. And while they are totally biodegradable, they are still made from trees and the process to make them is not great, Bob. But man, they are so CONVENIENT and sometimes you really, really want to throw whatever disgusting thing you've wiped up AWAY. Enter: the shop towel. 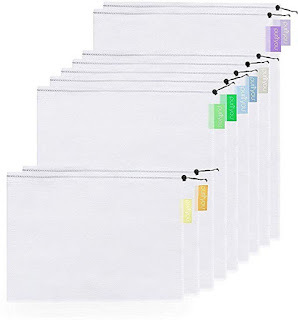 A 50 pack of these runs you $15 and they are the exact size of a paper towel. I keep the clean ones in an attractive wire basket on the counter, and the dirty ones get tossed in a bin (you know the ones) under the sink. I figured it needed to be as easy to grab and dispose of these as it is to grab and throw away a paper towel, and guess what? It's working! The biggest key to success, and I realize this sounds like a no-brainer, is to not have paper towels on the counter. 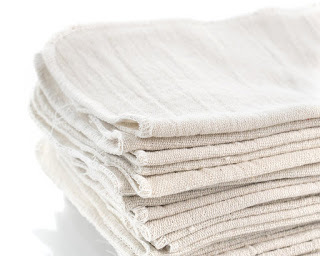 50 shop towels lasts longer than you'd think, we wash them about once a week. So easy! I HATE PLASTIC CONTAINERS. Not only do I feel like I'm probably slowly killing myself every time I microwave one for lunch, I hate how they scratch up, how they hold smells and stains, and how they inevitably take different sized lids that you lose. I just Marie Kondo-d my container cabinet and got rid of a whole box of lids and bottoms that didn't go together. 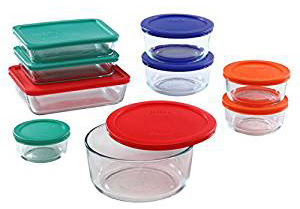 My favorite containers for leftovers and lunches are these Pyrex containers, so you know what I did? I got rid of every container I hated and ordered more of these. It's like the tupperware version of when I went nuclear on my underwear drawer. Now every time I open the cabinet, I am happy. Don't you want that happiness for yourselves? Look at those pretty colors! So satisfying. Deliver me from Ziploc bags. 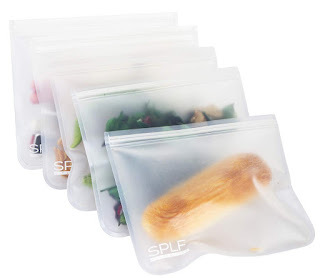 God, what's more convenient than a dang ziploc bag? Confession: my brother-in-law gives us a case of these amazing Ziploc plastic bags every year and we use them with abandon. DON'T WORRY I FEEL RULL BAD ABOUT IT. So, we're trying these and these out. So far, so good, although we washed the smaller ones on the top rack of the dishwasher as advised and now they are really hard to zip closed. I think we'll hand wash from now on. It's Not Just Reusable Shopping Bags. So, we've all been using reusable grocery bags forever, right? RIGHT? (I use ancient Envirosax that I've had for a million years.) But what about produce bags? Some places use biodegradable versions (thank you Trader Joes), but I still want to do better. I ordered these mesh bags off Amazon, and so far so good. It can be tricky to see the label through the bag when you're checking out, but we can all handle that, can't we? I love that there are different sizes because it makes me crazy to put one jalapeno in a huge bag. BUT THINK OF THE TURTLES! I am not sure what took us so long to realize that plastic straws are, like, not so great for the planet, but when I watched a poor sweet sea turtle have one pried out of his nose, I was like welp. Not doing that any more. Problem is, I love straws. And my kids love straws. The kids like these silicone straws but I find they taste a little soapy, probably because we run them through the dishwasher because who has time to HAND WASH STRAWS NOT IT. Anyway! 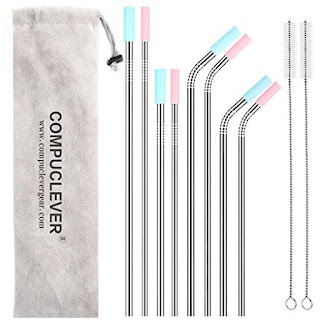 I like the idea of stainless steel straws but don't like how they feel on my teeth. And so, I finally found my super special snowflake straws, these stainless straws that have a little silicone tip. I bought this multipack, but my favorites are the bendy straws so I will probably buy more of those. I know, these are just drops in the bucket, but if we all tried to cut back on single use products it would eventually make a big impact. It also saves money and you have less trash to take out, which is a win win. I'm not exactly on the reusable toilet paper level of environmental awareness, but I feel good that I've successfully implemented these practices in my home. What are y'all doing? Is ANYONE cutting out toilet paper? That's where I draw the line but tell me everything. Not everything. You know. Great post! We do recycle, and the reusable bags, and glass containers, but I do feel guilty AF when I am cooking and use approx 47,000 paper towels. $15 is what we spend on a case of paper towels at Costco, so I'm going to order the shop towels and give it a whirl! I gave up using the produce bags entirely unless I'm buying something really floppy like parsley, or a dozen of something (which happens once a yea). The cashiers ring up my three loose lemons without a problem. I also use washcloths with my Swiffer! Dunk them in soapy water, and the cloth texture scrubs floors better than the disposable cloths. Works a treat and easily washable. I admire you all who gave up paper towels, but the thought of washing a cat barfy towel squicks me out. My biggest goal this year is to limit my plastic consumption. I ordered the beeswax wraps to replace plastic wrap and am going to use bar soap instead of body wash. Still trying to get the hang of the wool dryer balls and cut down my paper towel usage. I will definitely be giving the shop towels a go! And I love my reusable straws, produce bags and storage bags!!! I think I'm going to order the shop towels! I've been wanting to cut back on our paper towel usage. I switched over to glass pyrex awhile ago and have that set you linked to as well as a snapware pyrex set. I like the snapware set better as they are more leakprook, and the lids for the 2-cup round containers in the regular set have all cracked...which reminds me, I should order replacements! Are you vegan or even vegetarian? If you are that really helps the environment the most doesn't it? We're paper towel and ziplock-free. I LOVE Bentgo lunch boxes for kids' lunches--no bags or wraps of any kind needed and super easy to clean. Also, we don't use produce bags at the store at all. Just throw it all on the conveyer (grouped by thing) and it's totally fine. Let your jalapenos be free. Love the shop towel ideal! I have used Pyrex, but those lids eventually crack. I've moved onto Glasslock containers (can buy on Amazon). lids are leakproof and last longer than the pyrex ones! And I'll have to check out those reusable bags! My friend gave me a ones from a brand called Stasher recently and so far I like it!